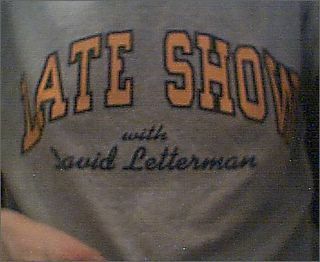 My new shirt from the CBS store. A kind of gift for myself. Hope you like it! Sorry man, but I have to pick on you... "I kind of present..." Don't you mean A kind of present. HeHe. Its about damned time you bought yourself something. This spells a vast improvement in your wardrobe. If you have to be a jeans and t-shirt sort of guy you best have good T’s ! Hey - do they let you wear this when your teaching. That would be cool. I hate having to wear shirts and ties all the time.